Bernie Sanders Wins The Maine Caucuses It's the third win of the weekend for the senator from Vermont. The victory was not altogether unexpected for Sanders, who continues to perform strongly in New England. 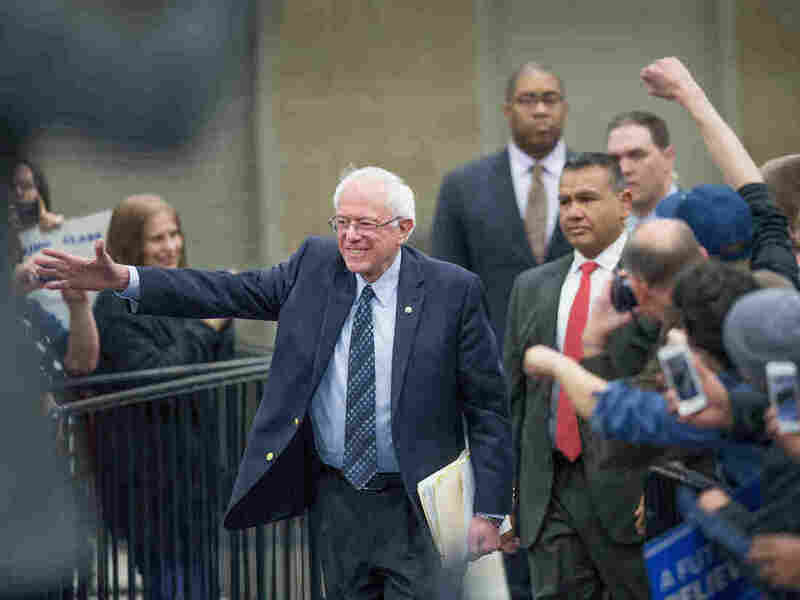 Sen. Bernie Sanders arrives for a rally at Macomb Community College on Saturday in Warren, Mich.
Sen. Bernie Sanders has won the Democratic caucuses in Maine, a victory that means he'll be taking home most of the state's 25 delegates at stake. With nearly all of the state's precincts reporting, Sanders leads rival Hillary Clinton by double digits, with more than 64 percent of the vote. "I thank the people of Maine for their strong support. With another double-digit victory, we have now won by wide margins in states from New England to the Rocky Mountains and from the Midwest to the Great Plains," Sanders said in a statement Sunday night. "The pundits might not like it but the people are making history." While the state was sparsely polled in the weeks leading up to the caucuses, Sanders' win was not altogether unexpected. The Vermont senator has had significant success already in New England, where he has blown out Clinton in primaries both in his home state and New Hampshire. The win makes for Sanders' third of the weekend. With victories in Kansas and Nebraska, Sanders entered Sunday having already won 47 pledged delegates this weekend. Yet, after Clinton's big-margin win in the Louisiana primary, which delivered her 55 delegates alone, Sanders' performance in Maine means the two candidates will have effectively reached a draw this weekend — a 66-63 split in pledged delegates, led by Sanders. Overall, Clinton still leads the race by 195 pledged delegates. Sanders needs more than half of the remaining pledged delegates to win a majority — and that number only rises with superdelegates factored in. But Sanders certainly didn't hurt his chances in Maine on Sunday night.